Dear friends and my valuable readers, wishing all of you who are celebrating the advent of New Beginnings today, loads of Success, Smiles, Good Health And Life's Finest, always for you. This is my final post in the Ugadi Special celebrations series for 2016. As we dawn our fineries and head out to pray and wish others, I am enveloped with gratitude and hope. Truly thankful for all the blessings, love and support I have received from all quarters. Very Hopeful that the New Year will bring with it loads of peace and shower my life and that of my loved ones and every person who has touched my life in some way or the other, with Good And Happy things. Both me and Mum-in-law have been up at the crack of dawn, to give final touches to all the things which will be included in today's celebrations and prayers. Also, we have got most of the food ready, so that right after the completion of rituals, we can head to the scrumptious spread of my mum-in-law's fares and some of mine too. The marigold garlands, mango leaves decorating our main door and the colourful muggulu (handmade floral design with coloured powder) sitting like a star in the main entrance, the aroma of incense sticks burning, the fragrant jasmine in the braids of all the ladies, the clinking of anklets and bangles, the happy whispers have quite transformed my humble abode into a festive sanctum. Soon everyone will gather, fold their hands in prayer and pray for health, peace, prosperity and overall success and happiness throughout the new year. This will be followed by the recitation of the Almanac(panchang) by the priest from the local temple, which each of us will listen intently. This is another significant Ugadi tradition, followed year after year. 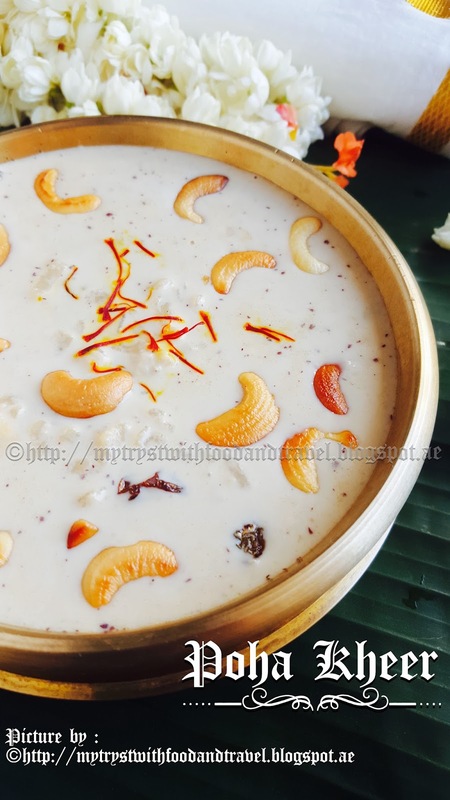 For any Indian celebration and festivity, Payasam / Kheer or Rice Pudding is a must. It has been a significant part of my growing years, especially an integral part of my Birthdays and that of Little D's too. Therefore every year I too try to include Payasam into these festive celebrations. This year I have gone ahead and made this Payasam with Flattened Rice and Jaggery. It is known as Atukulu Payasam or Poha Kheer. Its made with reduced, thick creamy milk, is very simple but does leave a lingering creaminess in your mouth much after you have finished a bowlful. So without much ado, let me take you through the ingredients and recipe of Atukula Payasam. 1) In a deep heavy bottom pan take the milk and place the pan atop your burner. Let the milk heat and then come to a boil, simmer now and let the milk thicken. While the milk thickens, finish the following. 2) In a frying pan add the whole raw cashewnuts and poppy seeds. ( NOTE ~ Add the coconut too, if you are using fresh coconut. I used dry grated coconut, so didn't add. ) Roast the ingredients for a minute. Remove the frying pan from the burner. Transfer the contents of the frying pan into a grinder. Add the grated dry coconut too. 3) In the same frying pan heat ghee. Once hot add the cashew nut halves, chopped almonds and chironji. Fry them till they turn light golden in colour. Remove them from the pan into a plate. In the same ghee fry the resins. Once the resins become plump, remove them from the frying pan into a plate. In the remaining ghee now add the flattened rice, coat each grain with ghee. Lightly fry them till crunchy. Remove the frying pan from the burner. 4) By this time the milk would have reduced and thickened. So you can now add the powder from Step 2 to the reduced milk in the pan. Stir nicely and mix the contents of the pan. Next add the fried flattened rice into the milk. Stir well. Increase the heat and bring the content of the pan into a rolling boil. Remove the pan from the burner. 5) Sprinkle the green cardamom powder. Next add the fried garnish, leaving a little for later. Your Atukula Payasam is ready. Garnish with the left over nuts and raisins, transfer into serving bowls and serve either hot or cold.